If you are trying to add healthy foods into your diet, consider raw peanuts. Even though they technically belong to the legume family -- the same group that includes beans and peas -- their nutritional profiles and health benefits are closer to tree nuts like almonds, walnuts or pecans. You can boil or roast raw peanuts before eating them or using them in recipes. Eating raw peanuts may be healthy for your heart, and the Linus Pauling Institute Micronutrient Information Center notes that people who eat nuts tend to have a lower risk for heart disease. A 1-ounce serving of raw peanuts has 11 grams unsaturated fat, which may help lower levels of bad LDL cholesterol in your blood. Raw peanuts provide about 2.4 milligrams of vitamin E, an antioxidant that may also lower your risk of heart disease. The folate, magnesium and potassium in peanuts also may promote heart health. 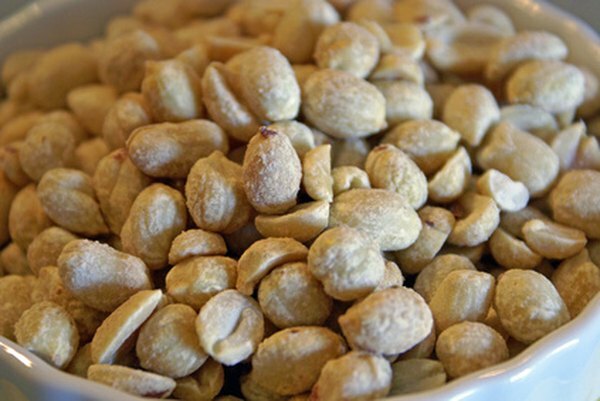 Raw peanuts may help you control your blood sugar because they have a low glycemic index. The glycemic index ranks foods based on the effects of their carbohydrates on your blood sugar levels. High-glycemic foods lead to spikes in your blood sugar, while low-glycemic foods like peanuts are slower to digest, and they keep your blood sugar levels more consistent. The fiber, protein and fat in raw peanuts may contribute to their lower glycemic index. Raw peanuts are unprocessed, and if you like to know exactly what goes in your food, raw peanuts might have an advantage over processed peanut products. You can reduce your sodium intake by making your own raw peanuts instead of salted roasted peanuts or peanut butter, which both have added salt and can significantly boost your sodium intake with each serving. Raw peanuts also are free from added sugars, and they have no trans fats from partially hydrogenated oils. The Linus Pauling Institute recommends eating nuts on a regular basis -- the equivalent to 5 ounces each week -- and raw peanuts can help you meet this goal. Peanuts are high in calories, with about 160 per 1-ounce serving, so eat them in moderation. The Institute suggests that when you add nuts into your diet, eat fewer calories from other foods so that you can avoid gaining weight.